On the sixth anniversary of the enforced disappearance of Lao civil society leader Sombath Somphone, over 100 civil society organisations worldwide called for the Lao government to conduct an independent, impartial, and effective investigation to reveal his fate and whereabouts. As previously documented by the CIVICUS Monitor, Sombath disappeared on the evening of 15th December 2012, after being stopped at a police checkpoint in a busy street in the capital, Vientiane. CCTV footage show unknown individuals forcing him into another vehicle in the presence of police officers. For the last six years, the Lao government has failed to provide any credible answers with regard to the disappearance of Sombath Somphone. In its most recent pronouncements, made during the review of Laos’ initial report by the Human Rights Committee (CCPR) in July 2018, the Lao government said it had been “trying very hard” to investigate Sombath’s fate and whereabouts. However, this statement has been contradicted by the government’s refusal to accept international assistance in conducting the investigation and to provide any details about the progress of its investigation. Lao authorities have failed to disclose any new findings from their investigation to the public since 8th June 2013 and have met with his wife, Shui Meng Ng, only twice since January 2013. 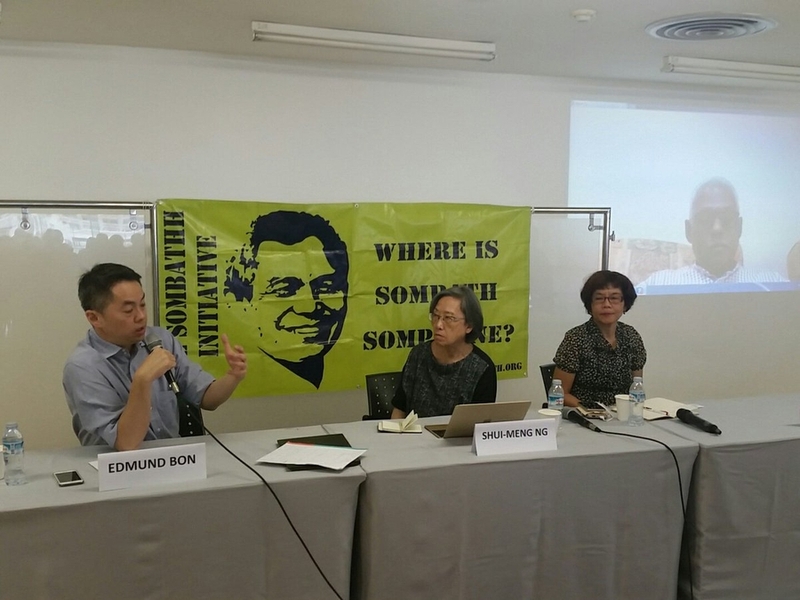 On 12th December 2018, ASEAN Parliamentarians for Human Rights, the Asian Forum for Human Rights and Development (FORUM-ASIA), Focus on the Global South, International Federation for Human Rights and the International Commission of Jurists, held a panel discussion in Bangkok, Thailand on the case of Sombath. During the panel discussion, Shui-Meng Ng, the spouse of Sombath, denounced the smear campaign against her husband put in place by the Lao Government, while no efforts are in place to investigate his disappearance. The panel discussion can be watched here. Seven Lao Christians arrested on 29th December 2018 in the Southern province of Savannakhet for conducting an “illegal” church service were released on 2nd January 2019. The seven detainees were arrested by police in Nakanong village, according to a report citing information provided by the Human Rights Watch for Lao Religious Freedom (HRWLRF). Police first took into custody three church leaders identified as Akeo, Kert, and Somwang, and then returned to take away four other church members named Boulai, Champee, Agae, and Ayoung. Authorities also demolished the church’s stage, cut off the power line, destroyed the sound system, and seized three mobile phones. Four Lao Christians arrested in November 2018 in the Keovilai village of Savannakhet province’s Vilabouly district were held in custody for a week for conducting religious services without permission from authorities. On 4th January 2019, Radio Free Asia (RFA) reported that villagers living in the Vang Vieng region are blocking attempts from a company to survey their land for a new Chinese investment project, fearing that they will be displaced from their homes. The project, managed by the Chinese firm Lao-Vang Vieng New Area Development Company, will affect 22 villages lying to the west of the Xong river and has been given permission from the Lao government to proceed. Villagers object to the plans and a villager leader said that verbal confrontations ended only when district authorities arrived to calm things down. Lao citizens cannot officially own property, while the government has the right to reclaim land in the name of public interest, as in the case of national development projects. It is believed that the proposed special economic zone (SEZ) called the Sustainable Tourism Development Project will reportedly cover thousands of hectares of land in Vang Vieng. In November 2018, a local civil society organisation expressed its concern for the status of 10 villagers who remain in prison, urging the government to disclose details on their case, including the prosecution’s timeline. As previously documented by the CIVICUS Monitor, in July 2017, 14 residents of a village in Thateng district were arrested by police for obstructing workers and cutting down trees on land granted by the government to a Vietnamese rubber company. The residents of Yeub village in Sekong’s Thateng district have been in a dispute with the government over land rights since 2006. Several of the detainees were allegedly beaten or subjected to electric shocks in the days following their arrest, while many are now malnourished and in failing health. In January 2018, one of the 14 villagers, Somsavanh, died under mysterious circumstances in police custody. The relatives challenged the government claims that the man had killed himself. Two children - Ny, a girl, and Nak, a boy - were released in June 2018. Speaking to RFA in condition of anonymity for fear of reprisals, the spokesperson of the local organisation pointed out that the detainees are facing poor conditions in jail and only allowed to meet with family members once a month after bribing the police.